The front of the building does not do justice to the magic that they are making inside the Macon Beer Company brewery on Oglethorpe. Photo by Doug Deal. 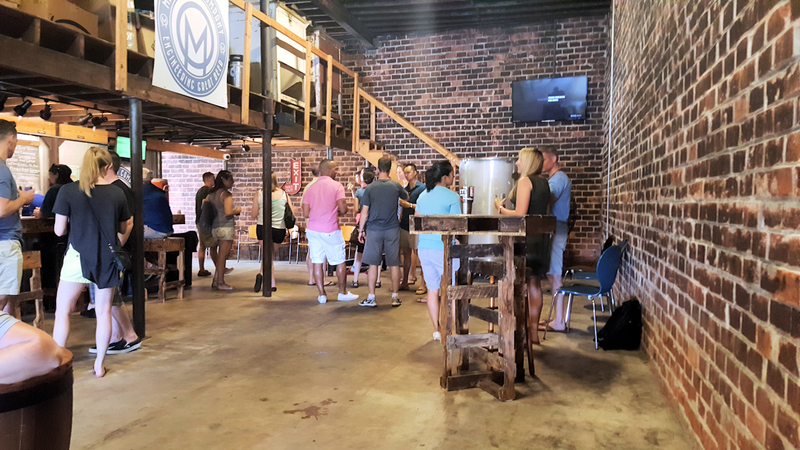 Macon Beer Company hosts Saturday afternoon beer tastings and tours of their microbrewery at 345 Oglethorpe Street in downtown Macon every weekend and on the third Thursday of every month. For $12.00, visitors receive a souvenir Macon Beer Company glass and six tickets, each good for a six ounce sample of beer. The event is from 1 p.m. to 6 p.m., and tours of the brew room begin at 2 p.m. It’s a pretty goof deal, even if you are only there for the beer, but the tour is informative and gives a sneak peak into the world of microbreweries. 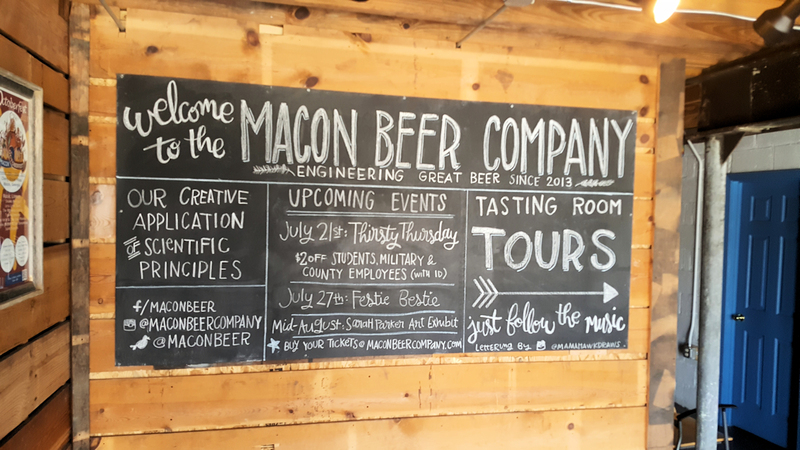 Macon Beer Company sign directing patrons to the tour and tasting. Photo by Doug Deal. 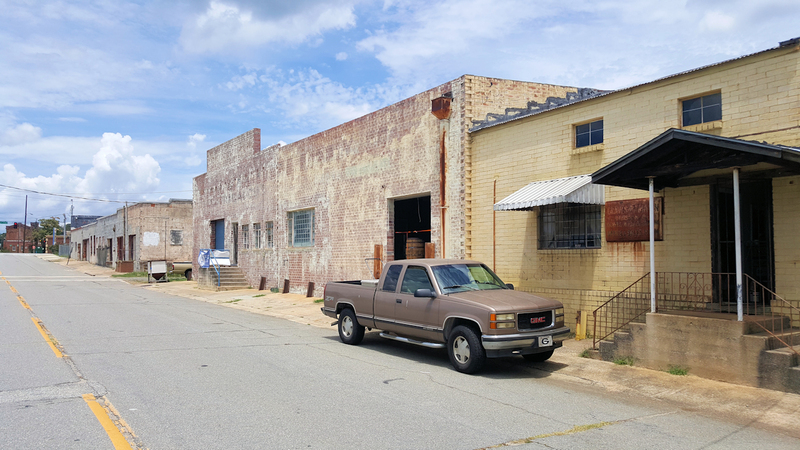 Macon Beer Company was the first local business featured on the cover of Macon Community News in our July 2013 debut print edition, and it was fun to revisit the brewery three years later. Owner Jeremy Knowles has grown the brewery from a mostly-empty warehouse and a good recipe, to a stylish, minimalistic brew house with a broad variety of beers. 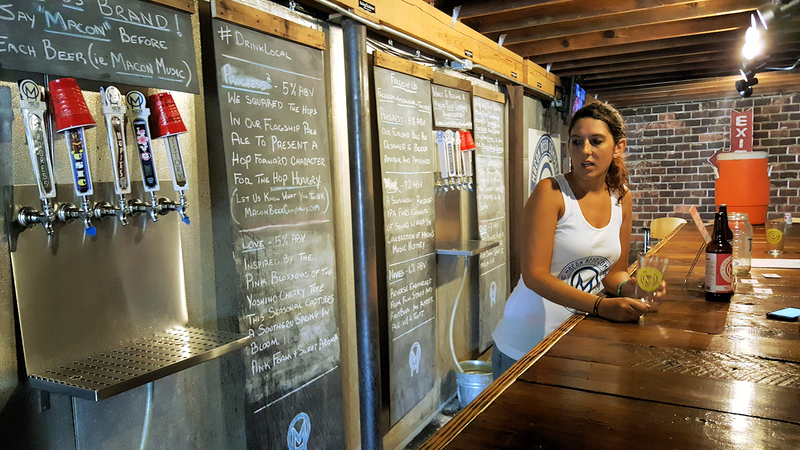 The Macon Beer Company taproom is staffed by volunteers and offers 5 or 6 beers depending on the season. Photo by Doug Deal. The warehouse is divided into two rooms, the brew room and the taproom. The taproom is open, with space for a corn hole game and picnic-style tables for playing board games. Two televisions hang from the ceiling, and industrial fans move air through the open spaces. Out back, there are more picnic tables in the beer garden. The taproom has a relaxed atmosphere with music and ample space to mingle and feel comfortable while you drink your beer. 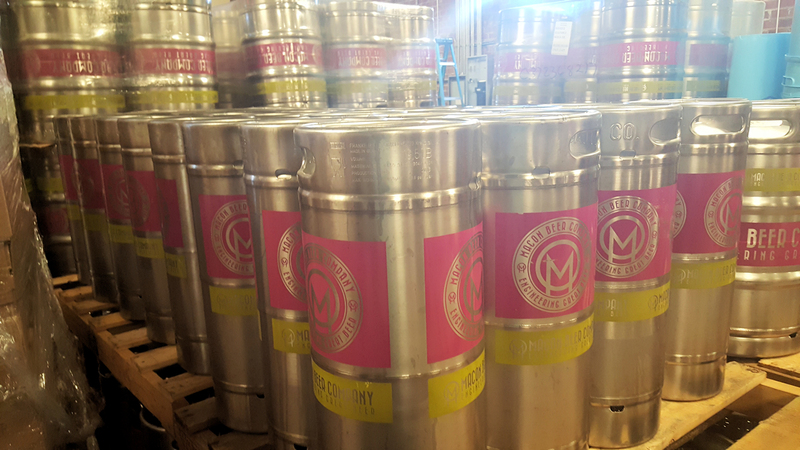 At today’s tasting, there were five beers on tap: Macon Progress, the “original” recipe beer; Macon Progress^2, a modified version of the original; Macon Love, the pink ale flavored with cherries; Macon Movies, which has undertones of root beer; and Macon History, a dark, hoppy brew. The lineup is scheduled to change as new beers come online and others pass their season. Macon Beer Company patrons await the tour as they sample various beers. Photo by Doug Deal. By the 2 p.m. tour, around 30 people had arrived. Jeremy invited us into the brew room. Where two used steel tanks stood three years ago, amid construction debris, there is now a room filled with shiny tanks, branded kegs and bottles, and the smell of hops and yeast. 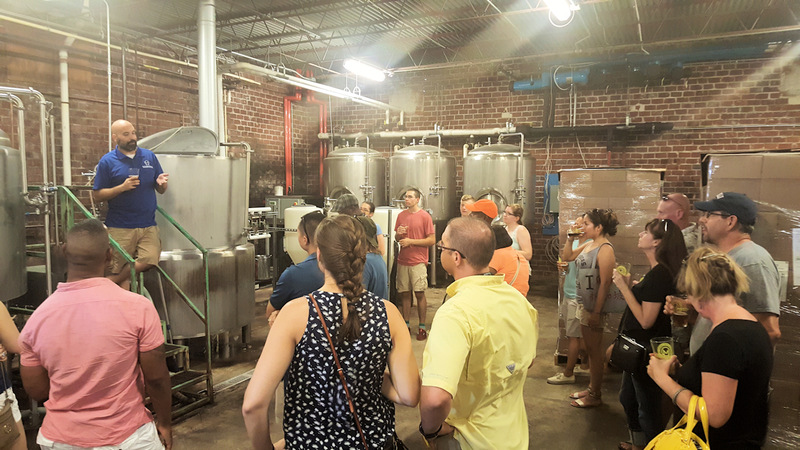 During the tour, Jeremy discussed the history of Macon Beer Company. He is a chemical engineer, and a Georgia Tech grad, and his approach to brewing beer blends science and art. His discussion was as interesting as it was informative. It’s pretty cool to learn how small batch beer is made, especially when you’re watching it happen. The whole process can take from 2 weeks to a month before a brew is ready, depending on how many fermenting stages it needs. The beer itself if not filtered, but is instead flocculated in a bright tank to remove particulates and make the beer crystal clear. Macon Beer Company fits both the craft beer aficionado and the casual beer consumer well. The flagship beer, Macon Progress was engineered to be accessible to those who have never tried a microbrewery and those who expect more out of their beer. Jeremy described it as a “transition” beer to get people off Bud or Yuengling and into a more complex beer. The taproom staff are all volunteers who love Macon, love beer, and love being part of Macon Beer Company. They make it easy to enjoy yourself. Macon Beer Company has a website, at maconbeercompany.com, and an active Facebook page, where you can keep up with their weekly taste and tour events, and other upcoming events. 1/6 barrel kegs stacked up and ready to be filled in the Macon Beer Company brewery. Photo by Doug Deal. In this story we have also added a new feature, a 360º view of the brew room. If your browser is capable of showing it, you can move the photo around to see every direction. We plan on adding these photos periodically when appropriate. 360 image of the brewery with a tour in progress. Photo by Doug Deal.